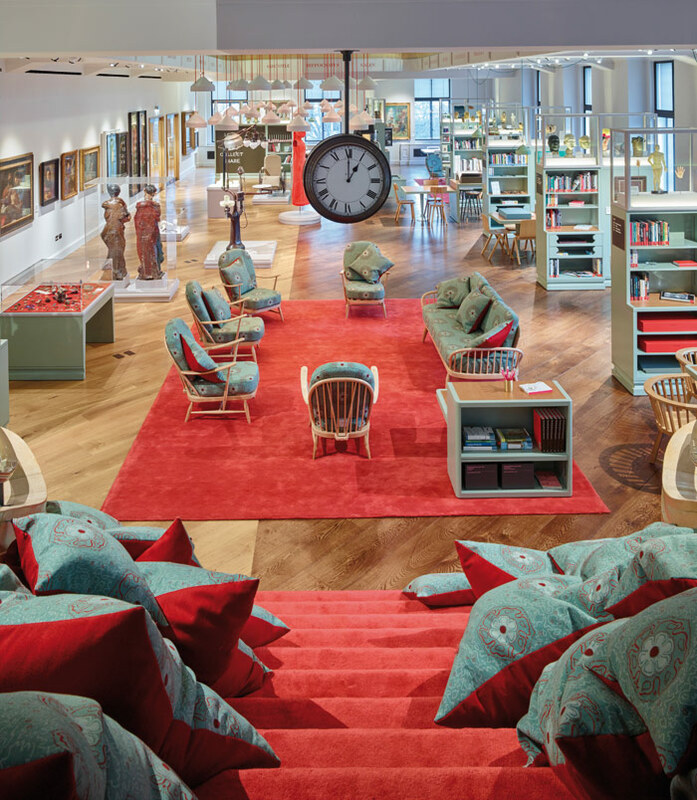 The Wellcome collection in London recently opened its doors on a new £17.5m renovation that saw its foyer penetrated by a stunning £1.1m 'dynamic' staircase leading visitors up to the delights of its medical archives and exhibition spaces on the floors above as well as a fine-dining restaurant. But the centerpiece of this refurbishment -- in my view -- is the glorious new reading room and library. At the top of the spiral staircase you emerge into the most thrilling combination of knowledge repository and playroom. A strip of red carpet guides your eye to a rear staircase festooned with voluptuous beanbags. Exhibits from the Wellcome's medical collection are displayed in their cases on top of bookshelves, or placed out in the open on tables or in nooks for you to touch and encounter. A theatrical assortment of props enhances each themed area -- straitjackets and a Freudian chaise longue in the psychiatry section, for example. Excited chatter from teenagers isn't snuffed out by library personnel, but encouraged with a gentle nod and 'it's fine to talk'. And everywhere, the serendipitous arrangement of books on topics that would take a year of uninterrupted reading to get through: what kind of knowledge-fostering Utopia is this? The 21st-century library is a very different place to the 20th-century version -- all dusty shelves, dog-eared books and hushed tones. It's a very different place to what had been envisaged even 10 years ago, when the custodians of our digital networks -- along with the media -- were trumpeting the end of the book. As evidence, one need look no further than Oxford University's Bodleian, which recently opened the doors on Wilkinson Eyre's £80m refurbishment of what used to be known as the New Bodleian library, now renamed the Weston Library. The refurbishment has found ways of celebrating both heritage and modernity, while allowing the public to access certain sections of the library's phenomenal collection for the first time. Libraries were never on the way out, according to the Bodleian's chief librarian Richard Ovenden: 'It was a slightly overegged viewpoint in the media, somewhat inspired by hype from the technology industry,' he says. So what has happened to rekindle (pun intended) the populace's love of these places? Ovenden says: 'There's something around...the use of libraries as physical spaces; they have become almost more popular. If anything, the value of libraries has been highlighted because of the digital. You can pick up information through so many devices now that can receive or transmit information to you, that actually having time to sit quietly surrounded by other people concentrating is a highly valued service. Wilkinson Eyre was challenged with not just restoring the glorious book-lined reading rooms that Giles Gilbert Scott had designed for the New Bodleian, but also creating new ones. How did Eyre go about updating the reading room for the modern bookworm? The public's appreciation is palpable. The ground floor of the Weston library is open to the public, with exhibition galleries, temporary displays and a cafe. Says Ovenden: 'This is part of an atmosphere in education and the world of research which is speaking much more to a general audience and is open to that kind of engagement in ways that would have been inconceivable 10 or 15 years ago. We have an exhibition on at the moment, around the theme of genius. Most of that material is available digitally and freely on our website, but since we opened we've had a 250,000 visitors come and see it. Somehow, being in the same room as a document written by Elizabeth I, which she gave to her stepmother Catherine Parr as a present, sends shivers down people's spines in a way that seeing it on a screen just wouldn't. It's the talismanic quality of the original.' And there is a talismanic quality to the library itself as a public building -- one in which knowledge could be yours for free. That talismanic quality is being seized on by communities and businesses everywhere, as local authorities increasingly abdicate their responsibilities for running local libraries. Community groups and public art organisations are getting together to try and save these buildings -- offering them up as artist studios and community centres in ways that will hopefully help ensure their future (turning dusty offices into co-working spaces, craft shops, cafes and venues for events). Others are being transformed into general entertainment and information hubs, such as West Norwood's library, which is scheduled to be turned into a cinema by Picture House Cinemas -- on the understanding that the library is maintained. Perhaps it is the serendipitous nature of the bookshelf that is being rediscovered and appreciated anew -- the way it can throw unlikely and inspiring ideas at you that certainly wouldn't have emerged from Amazon's digital algorithms (you liked X so you might like Y). 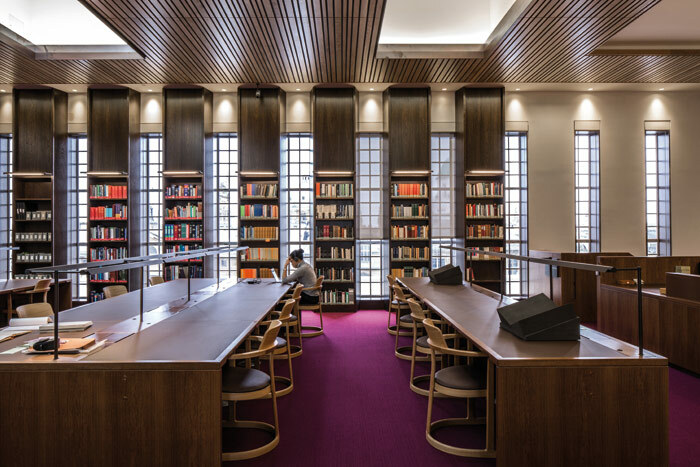 Geoff Shearcroft, director of AOC architects, which transformed the Wellcome's already mentioned Reading Rooms, confirms that the mood from analogue to digital has definitely shifted. With the Wellcome's Reading Rooms, for example, 'when we started the project, it was assumed that there would be a digital overlay. The book is clearly far from dead. Vive le bibliothèque! A year ago the Wellcome Trust (allegedly the world's richest charity) reopened its handsome neoclassical Research Institute, designed by architect Septimus Warwick, to reveal Wilkinson Eyre's £17.5m remodelling aimed at tempting visitors up and through the building and away from the more obvious delights of the ground-floor cafe, bookshop and exhibition galleries. Reached via a new 'dynamic' spiralling staircase, the second-floor reading room and library has had its fusty, bookish clothing cast off, to become one of the building's most spectacular and inviting spaces. Director of architecture and design studio AOC Geoff Shearcroft says: 'The existing space was fantastic, and a lot of what we did was to strip back 80 years' of clutter. We ended up with a double-height, triple-aspect room, and then explored with the Wellcome how we could keep the room feeling open and light so that the architecture complements the objects rather than fighting it.' 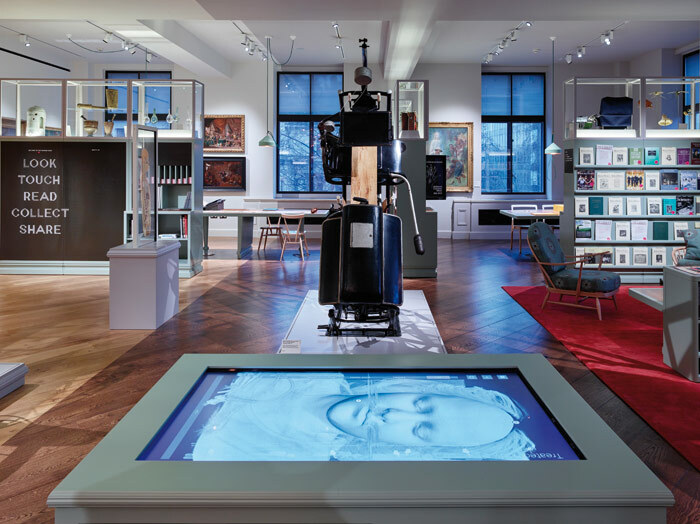 AOC had to find a way of exhibiting the Wellcome Collection's amazing 10,000-item archives of art, medical equipment and artefacts in a way that would encourage participation -- but only where appropriate. AOC divided the room into contrasting environments. White walls, grey joinery and a light-colour timber floor on the west side evoke a modern gallery aesthetic, complementing the collection's paintings and artefacts displayed on plinths (a presentation that gives off strong 'no touching' cues). On the east side, a dark timber floor and wood furniture evoke a library setting, but made far more cheerful and 'homey' with surgical green walls and shelving plus an eclectic mix of lab tables, desks and chairs. 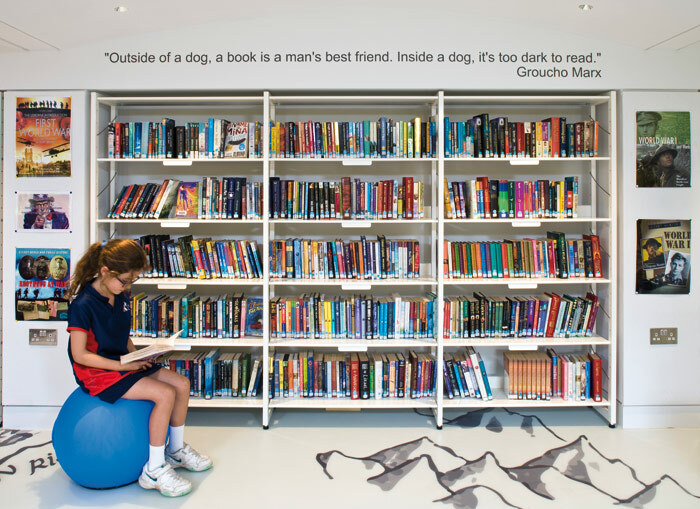 In the centre, a carpeted area with comfortable chairs and sofas invite visitors to settle down for a good read. Cabinets, vitrines and shelves create natural 'niches' themed around the collection, enhanced with set pieces -- for example, you can recline on a high-quality replica of Freud's chaise longue or try on a bona fide straitjacket in the psychology and psychiatry section. Elsewhere, a game of Operation sits next to an antique scroll that you are invited to touch -- but only after putting on archivists' white gloves. 'Allowing people to engage with unfamiliar objects is a very potent experience,' says Shearcroft. Felt-lined memo boards and magnetic pegboards invite visitors to contribute to the conversations in the room. 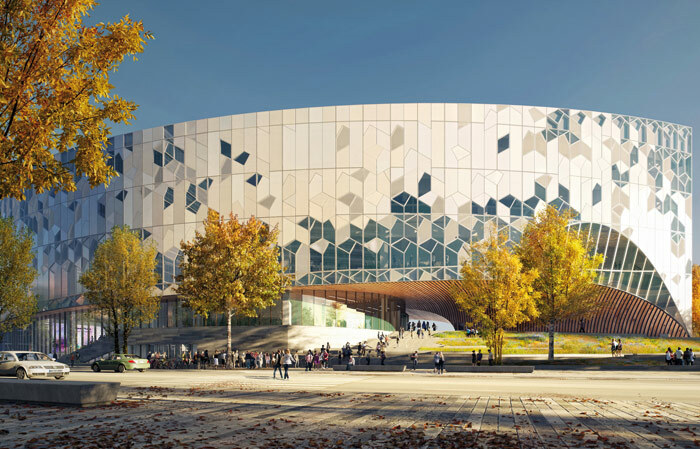 The resulting scheme challenges the associations and behaviours of conventional library and exhibition spaces.